As a Dog Photographer here in Orange County, sunny Southern California, I'm sincerely grateful to live close to the beach. Beaches are my favorite places. The other night, some friends and I were talking about what rejuvenates each of us, and for me — it's the beach. To me, time slows down at the beach. It's the only place I know of where I feel like I'm having fun and time is flying...but I look at the watch, and only an hour has passed. That's why when you bring dogs into the mix, it's a taste of heaven on earth for me. Now, imagine if those dogs are short, stumpy, sturdy, balls of fur with the most ridiculous peach-shaped waggles. Welcome to So Cal Corgi Beach Day. You know there's a phenomenon happening when Corgi owners are flying from out-of-state and even from out-of-country to be part of this event with more than 1,000 guests in attendance. This is my third So Cal Corgi Beach Day, and it’s by far my favorite yet. This time, my wife, Leanna, and our Westie, Maya, joined the fun. Maya was an "Honorary Corgi" for the day. Kelly, Dan, and Mr. Pickles — the founders of So Cal Corgi Beach Day - continue to put on an extraordinary family-friendly event full of adorable Corgi contests, food trucks, shopping, tattoos for dogs, photo booths, a Corgi kissing booth, bacon-flavored bubbles, and celebrity Corgis with more Instagram followers than the population of several nations. 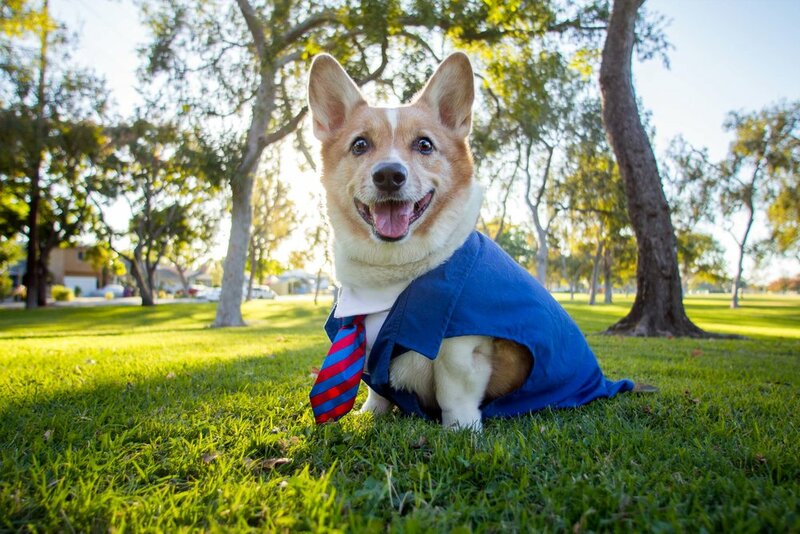 But more importantly, the entire event is designed to educate humans and point them to Queen’s Best Stumpy Dog Rescue, a non-profit in Los Angeles determined to rescue Corgis from high-kill shelters, to rehabilitate and rehome them. Mr. Pickles. The inspiration, founder, mascot, and brand ambassador of So Cal Corgi Beach Day. And, if all of the activities sound like too much for you, just bring your beach towels, sit back, and relax on the sand with your best furry friend. If you live in Southern California, you’re a dog lover, and you’ve never been — I hope you go at least once! Dogs + Beaches = Heaven on Earth. Without further ado, here are 100 dog portaits from So Cal Corgi Beach Day, Spring 2018, at the world-famous Huntington Dog Beach in Huntington Beach, CA! This is Ingrid, a purebred Swedish Vallhund. She’s of an ancient breed as the Swedish Vallhund is believed to be the ancestor of the beloved Corgi breed. This Corgi is Atticus, and he likes to arrive to the party in style. I was crossing the cross-walk, and this little guy and his human pulled up. Of course, I stopped (safely) in the middle of the street to document this moment. You can follow Atticus’ motorbike journey on Instagram here. He's so cool! An adorable girl with her Corgi. Maya met Mr. Pickles! Of course, of all the dogs I photograph, I can't get my own to look at the camera when I ask her. These two are Moose and Koda. I've been following them on Instagram for months now, and as soon as I saw Koda I immediately recognized a sweet, familiar face. They go on gorgeous outdoor adventures together, and I love that they have done one of my favorites - the Bridge to Nowhere Hike in Azusa Canyon. You can follow their adventures on Instagram here. That's our Maya photo-bombing in the back there. Jax and Dallas are back! I’ve been photographing these two since the first time I met them at Corgi Beach Day last summer. And now they’re back in matching Hawaiian shirts. You can follow Jax and Dallas' Instagram here. This is PB! A Dorgi -- which I just learned yesterday is a Dachshund-Corgi Mix. You can follow the adventures of PB here. This one's Barley! I've also seen Barley and her partner-in-crime, Bubbles, every time I’ve been to Corgi Beach Day. They never fail to surprise us with their elaborate costumes! They were posing for pictures and selfies with the public all day, but here I got Barley taking a break in the 'Green Room' for a moment. You can follow Barley and Bubbles on Instagram here. And here's the famous Corgi "Momo" Contest. I learned “Momo” is the Japanese word for peach, which is what the Corgi’s backside looks like. I missed the “Best Momo” contest, but here’s one for fun. Mr. Pickles, is that you? But, I did catch the pie-eating contest! Here’s Shortstack the Corgi getting ready to devour some pie-prey. Cue BBC narrator. Mr. Pickles showed no mercy to this pie. After Corgi Beach Day, we met this little one at In-N-Out. One of my favorites! A Corgi digging. "What do you have over there?" "Does anybody know how to get water out of your ears?" "Is he taking pictures of me?" "I guess I better smile!" "This is my big smile!" From here on out, we'll be looking at Honorary Corgis of the Day. Uh-oh! They've discovered Maya's cuteness! Did you know Maya also has her own Instagram? Funny story: This dog is also named Maya. So when I was calling Maya to come to me, this other Maya immediately looked at me too. CAUTION: The following images of this Basset Hound may result in the melting of the human heart. And that’s a wrap for So Cal Corgi Beach Day - Spring Edition 2018. Maya, Leanna, and I had such a great time petting all the Corgis! I'm honored to once again document these beautiful, joyful, and silly animals we call our best friends. As Dog-Parents, it's so important to capture every little fun and adorable moment of your fur-babies, and ultimately, build a collection of memories, and a legacy, that will last beyond their years. If I can help you document your own best friend’s journey, please give me a call! I would love to meet with you for a complimentary Design Consultation. You can start by telling me more about you and your dog here. I just did a Very Important Pet (VIP) pet portrait session for a sweet Beagle named Megan. You can read about her experience here. "I am not quite sure how much time my dog and I have left together, but I am so glad I contacted Steamer to capture some gorgeous photos of me and her together while she is still active! For those on the fence about a photographer because of the cost, I would highly suggest to go for it! We only have limited time with these family members, and the end result of beautiful pictures makes it all worth it. The saddest part of having a dog is the limited time we have with them, and I know these pictures will help keep these precious memories with me forever"
So don't wait too long! If you have a puppy, wouldn’t you want to remember those formative years? They grow up so fast. Every 3 months they’re going through another growth stage, until about 1 year old when they’re considered fully-grown adult dogs. I've got room for only three in May. Let’s design your photographic experience together. Megan making paw prints in the sand at Huntington Beach Dog Beach, for her Orange County Dog Photography VIP (Very Important Pet) experience. If you grew up with Charlie Brown like I did, then you probably wanted a beagle growing up. That's why I was so excited to finally photograph a beagle. But instead of the black-and-white look of Snoopy, Megan is a tri-colored beagle: black, white, and red. And instead of the attitude, Megan is "sweet, gentle, funny, friendly, and gluttonous," as her dad describes her. Megan is only 15-years young, still active and healthy. But recently, Megan's been going through a journey of cancer treatments, and no matter what happens, Megan's dad is living life to the fullest with her, with a love that overcomes these obstacles. Megan's dad is a photographer himself, with his own DSLR camera, and like any proud father, he was in no way hesitant to show me all the photos of his fur-baby. "She's a well-documented dog," he said. Which is so awesome! And here's why: As Dog-Parents, we get to have these four-legged fur balls who inspire us to love unconditionally, to live in the present moment, and to be a better people -- and we get to document their beautiful lives everyday. He showed me photos from her birthday of Megan with her uncle, Megan running toward the camera, and shared about how he just loves the way her ears flop around when she's running in the yard. And then, there's the trash can. If you've been having serious issues with four-legged residents raiding your trash can, Megan's dad can help you. He's researched and tried many iterations of "anti-dog" trash cans that keep her from sticking her nose in there. A California backdrop. He already has professional portraits of her in the lush, tropical environment of Florida. This time, he wanted to make portraits of Megan's retirement in California. After listening to all of that, I knew I wanted to photograph Megan at the beach because nothing feels more "California" to me than being barefoot in the sand, with the gorgeous California sunset that you can only see on the West Coast. I was so glad he shared this with me and it was my joy to be able to provide these shots for him. Take a look! I'm a sucker for close-ups portraits of dogs. They instantly make me feel like I'm looking straight into their eyes, and I can hear the little *sniff-sniff-sniff-sniff* sound that dogs make when they curiously come up to you like this. Besides, beagles are known for their powerful noses. The famous Tower 22, at Huntington Dog Beach. I love this moment because the backdrop of the palm trees, the birds, Huntington Beach Pier, the ocean -- they all speak "California" to me. When making this portrait, I felt like there were four subjects I wanted to incorporate: Megan, Megan’s dad, Megan’s reflection, and the California backdrop. Behind-the-Scenes: My wife, Leanna, came to assist. She took some amazing Behind-the-Scenes shots with her iPhone. And there’s moments like this. Pure contentment. Sand on her nose. Her peaceful expression, and Megan’s dad is in pure joy. I love the rain! Though we had to re-schedule Megan's portrait experience because of it, what I do love are the clouds that remain after a generous downpour. Which leads me to my favorite portraits from our experience. I love the following images because you see the gorgeous West Coast sunset, the different hues of color floating among the clouds, and a small glimpse of Catalina Island in the back. And of course, little Megan modeling for us with her little paws making paw prints in the sand. Always looking for the treat I dropped. As Dog-Parents with our own iPhones and DSLR cameras, we have the privilege to capture every little fun and adorable moment of our fur-babies, and ultimately, build a collection of memories, and a legacy, that will last beyond their years. But, Megan's dad's request really stood out to me because, even as a photographer myself, there are shots that I cannot produce: the ones that I want to be in with my own dog. This makes me so grateful that Megan's dad asked me to help preserve the legacy of Megan, capture her "sweet, gentle, funny, friendly, gluttonous self," and make works of art that document their relationship together. Megan, Leanna and I are so happy to have met you! Especially Leanna, she thinks you're absolutely adorable. I did a Holiday Mini Session with a small puppy corgi, Spenny, and his human owners. Kristie reached out to me to do a short and sweet, simple photo session with just a girl and her dog, and her boyfriend. But two weeks before our photo shoot her boyfriend, Matt, secretly emailed me about wanting to propose to his girlfriend at the photo shoot. He told me they're always together, and it was next to impossible to plan something special without appearing suspicious like he was up to something. He wanted that element of surprise! And this photo shoot seemed like the perfect time to do so. Oh man, what if I mess this up? What if I pick a terrible location, and there's people all over the background, and it turns out to be lame? But! This would make such a great story to tell! And wouldn't it be awesome if, as a photographer, I was able to capture this moment for them? To remember for the rest of their lives? I know I was happy that I asked my professional photographer friend to photograph my proposal to Leanna. And, Spenny would be there, part of the moment! I told him since there was an open Mini Session slot right after Spenny, I'd let them have the the next slot as an engagement gift. That way, we'd have more time to photograph and celebrate their engagement. One week before our photo shoot, we had a secret meeting at a super secret spot called Starbucks. There, we hatched out the plan. I wanted to get to know them better, so I could best know how to serve them. We talked about their relationship, what they like and what they don't like, and we talked about Spenny. We talked about making signs, like "Engaged!" or "She said, 'Yes'!" But we couldn't find a great idea on how the actual proposal would take place, in a way that would come as a huge shock and surprise to Kristie. When the caffeine finally kicked in, I said, "Okay, how about I tell her to hold Spenny and look at me, and pretend to take pictures of just the two of them. Then I'm going to tell her to keep in looking in one direction, while you sneak up from behind and get down on one knee. Then at the right moment, I'll ask her to turn around, and there you are, on your knee and ring in hand." And that's where we left it. I decided to ask someone who's been proposed to for help - my wife, Leanna. She helped me with the planning process and helped create props for the photo shoot. Come photo shoot time, three out of four people at the photo shoot knew what was going to happen. But I had to play it cool, and act like it was just going to be a simple, short, and sweet Holiday Mini Session of Spenny. And there's that puppy personality coming out! As for our Holiday theme, we decided to put antlers on Spenny. After all, Spenny is named after the reindeer in Frozen, Sven. And if you're a dog owner, then you'd be just as surprised as we were that the antlers stayed on long enough to take these Holiday portraits of Spenny. During the photo shoot, I kept thinking, What if I mess this all up? What if I somehow ruin the surprise? I think was I more nervous than Matt. I started looking around, seeing where the right angle and look would come from. This photo is going to be in their family forever! When I finally saw an angle that I liked, I summoned up the courage, took a deep breath, then asked Kristie to just get some photos of her and Spenny alone. Then, I looked over the Matt and gave the "signal," a nod and a wink. Except Matt wasn't getting it. I gave another signal. Nope. Oh, great, I'm going to ruin this. Kristie is going to totally catch on. I think it was my third or fourth or fifth nod when I turned to Matt, and said out loud, "Hey! Can you go around the back and fix Spenny's leash so it's not in this shot?" Then I made sure to wink dramatically. He finally got the signal. Can you feel the nervous energy of this moment? Meanwhile, Leanna was off to the side, recording the moment on her iPhone. Kristie saw what was happening, and tears started flowing, all the while she was still holding onto the big, fluffy Spenny. Leanna and I caught the whole moment on camera, both in still photography and video. "What happened next?" you ask. We're not going to show everything of course. Some special moments are better kept special, and exclusive. I especially love this triumphant smile of Matt, Kristie just adoring her new accessory, and Spenny probably wondering what's for dinner later that night. Speaking of Spenny, I'm so glad Spenny was a part of this because Dogs are Family. And in every photo of this beautiful moment, their precious little Spenny was part of it. He'll forever be in their family photos and stories for years to come, as part of this milestone in their lives. And it was so adorable to see her melt in the moment holding Spenny wrapped in both of her arms, providing comfort and joy in this precious time of her life. And the best part? We totally surprised her! She didn't see it coming at all! Notice anything different on Kristie's ring finger? Engaged! The beautiful "Engaged" banner there was designed and crafted by my lovely wife, Leanna. Congratulations Kristie on your lovely engagement! And congratulations to the soon-to-be Best Dog, Spenny! As Spenny’s mom and dad, we wanted to have portraits of Spenny as a puppy to remember him as a puppy. But, we can only do so much to ask him sit or stay for a picture. Even though we know he is a puppy and he's so distracted by the world, we can still get impatient with him. We appreciated how Steamer took the time to get to know Spenny and to be patient with him in taking the pictures. Now we have a huge, 20x30 framed print and also 16x20 prints of Spenny hanging all around the living room. When we got the final printed portraits, we felt happy that we could show off Spenny to guests in our home. They really like all of Spenny’s portraits! We were happily surprised with how smooth the whole process was and we are very happy with the finished products! Thanks for everything, Leanna and Steamer! My Dog Photos were featured at Union Market, Mission Viejo!